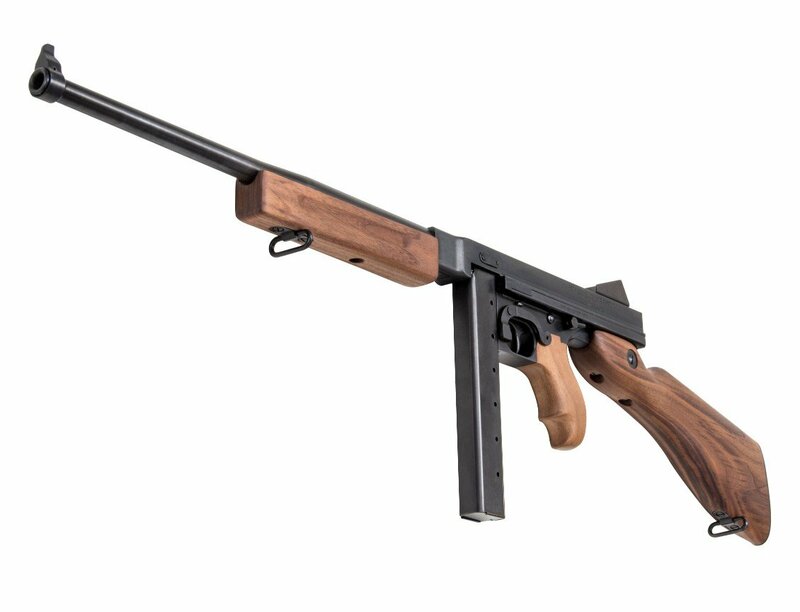 Thompson M1 - Auto-Ordnance | Original manufacturer of the world famous "Tommy Gun"
Our M1 Thompson model is a .45 caliber semi-automatic replica of the most famous American submachine gun of World War II. The Thompson M1 was used victoriously in battles throughout the world, ensuring its place for eternity as a legend among military firearms. We offer the same attention to craftsmanship today that made the original so highly regarded. The look and feel are authentic, right down to the side bolt action. The frame and receiver are milled from solid steel or aluminum, the wood is genuine American walnut, and the overall finish is a blued steel or black anodized aluminum. Built to modern engineering standards, the Thompson M1 is a reliable and highly accurate representation of its legendary WWII ancestors. Order one for your collection, and own a piece of American history!